•Coupons must be presented at the beginning of the order and the AdvantEdge Card must be scanned or entered prior to coupon deductions. •Coupons are limited to four (4) like coupons or like items per household per day. •We only accept coupons for items that we sell, and items purchased must be identical to the items shown on the coupon (size, brand, quantity, etc). •We do not accept any coupons beyond their expiration date. •We are required to comply with all manufacturers’ coupon requirements. For example, a manufacturer may prohibit the doubling of coupons. •Any applicable sales tax must be paid by the consumer. •Refunds and rebate checks will be cashed at the Customer Service desk only. •We do not accept any coupons presented on a smart phone or other digital device, regardless of source. •Price Chopper teammates must be able to verify all pertinent information on the coupon. •Price Chopper reserves the right to reject any coupon that does not conform to our policy. •Price Chopper voluntarily doubles, at its own expense, paper manufacturer coupons with a face value of up to and including 99 cents, except when prohibited by the manufacturer. Coupons with a face value of $1.00 or more will be redeemed at face value. •We do not double coupons for cigarettes, tobacco, milk and alcoholic beverages in states that permit the usage of coupons for these items*. •Total double* value of a coupon may not exceed the item’s retail price after AdvantEdge discounts. •We do not double competitor coupons. •We accept only one manufacturer’s coupon, digital or paper, per item purchased, not to exceed the retail price after AdvantEdge savings. Price Chopper accepts one manufacturer and one Price Chopper store coupon for the same item (unless prohibited elsewhere in our policy, on our coupons, or by the manufacturer). •We will accept only one (1) manufacturer coupon for an advertised Buy one, Get one free offer, not to exceed the AdvantEdge price. 1. We will double* one manufacturer’s coupon for an advertised Buy one, Get one free offer, not to exceed the retail price after AdvantEdge savings. 2. We will not accept a manufacturer’s coupon for the product that is received free as part of a Buy one, Get one free offer. 3. For a coupon that has a purchase requirement of two (2), we will accept one manufacturer’s coupon. In that case the manufacturer’s coupon will be applied to the free item in a Buy one, Get one free offer. •Manufacturers’ paper coupons for free items, mail-in certificates, and unspecified items will be redeemed at face value or free value only. •We accept valid Manufacturers’ internet coupons (which must be printed out prior to purchase) with a face value of up to $5. This may include free offers and Buy one, Get one free offers. Price Chopper may offer Internet coupons through Pricechopper.com, email, and Facebook that may exceed this $5 limit. •We accept one (1) paper competitor “dollars off your order” or “cents off per gallon of gas” coupon from other supermarkets and mass retailers (Wal-Mart & Target) in our trade area; the value of which may not exceed 50% of the order. This coupon may not be combined with any other “dollars off an order” or “cents off per gallon” coupon, including Price Chopper “ dollars off” and “cents off per gallon” coupons. Examples of this type of coupon are $5 off a $50 purchase coupon or save 20¢ off per gallon of gas with a $50 purchase. The dollar amount of the purchase requirement, if any, will be determined after AdvantEdge savings and all other coupons have been deducted. Purchase requirement does not include alcohol, tobacco, gift cards, stamps or lottery tickets. •We accept one (1) paper competitor “dollars off a category” coupon from other supermarkets and mass retailers (Wal-Mart & Target) in our trade area; the value of which may not exceed 50% of the order. This coupon may not be combined with any other “dollars off a category” coupon, including a Price Chopper “dollars off” coupon. An example of this type of coupon is a $5 off a $25 pet food purchase coupon. The dollar amount of the purchase requirement, if any, will be determined after AdvantEdge savings and all other coupons have been deducted. Purchase requirement does not include alcohol, tobacco, gift cards, stamps or lottery tickets. •We accept paper competitor coupons for specific items from supermarkets and mass retailers (Target & Wal-Mart) subject to the conditions expressed on the coupon and provided we carry the item in our store. A paper competitor coupon for their store brand will be accepted for a comparable Price Chopper brand product of the same size & weight. The dollar amount of the purchase requirement, if any, will be determined after AdvantEdge savings and all other coupons have been deducted. •Catalina “manufacturer” coupons issued at checkout by a competing supermarket are considered competitor coupons and subject to the same policies in this section. 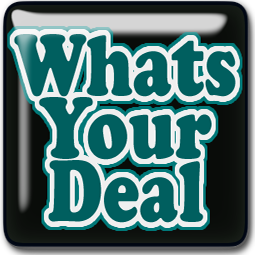 •We do not accept a competitor coupon and a Price Chopper coupon on the same item. •We do not accept double or triple coupon offers from competitors. •We do not accept competitor coupons earned on a loyalty rewards program, competitor digital coupons or coupons from any warehouse club, dollar, limited food assortment or drug store. Examples of these types of stores are CVS, Walgreen’s, Rite Aid, BJ’s, Aldi, Save a Lot, Family Dollar, and Dollar General. •We are proud to offer our customers AdvantEdge e-coupons which can be loaded to your AdvantEdge card through our website or our mobile apps. We do not accept digital coupons from any other source. •Digital coupons will be applied prior to deducting any paper coupons. A manufacturer digital coupon and a manufacturer paper coupon cannot be used on the same item. 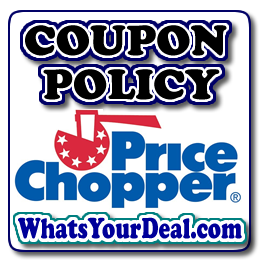 •Price Chopper accepts one manufacturer, digital or paper and one Price Chopper store coupon, digital or paper, for the same item (unless prohibited).